The Trump Administration considered moving to a destination-based cash flow tax. There is a growing concern about the impact of the proposed border adjustment on trade. Border adjustment on sales tax, which tax imports and exempt exports, is a common way of taxing only goods consumed in the country, i.e., based on the destination rather than the origin of the goods. Standard economic models imply the border adjustment does not affect trade patterns or trade balance because the real exchange rate adjusts, keeping domestic and foreign producers on a level playing field. But many market participants fear the border adjustment will be protectionist, favoring domestic products over foreign ones and disrupting supply chains. The purpose of this paper is to analyze the impact of border adjustment tax affects exchange rate and balance of trade. First, the paper will analyze different study approach to isolate movements in the real exchange rates, trade balance and other variables around the dates the countries that first implemented a VAT (value-added tax). Secondly, it will analyze the initial implication of the border tax assumption to the US real exchange rate and balance of trade using a dynamic model to explain its long run economic implication. Why Should the Real Exchange Rate Adjust to Value Added Tax? Border adjustment on sales taxes, which tax imports and exempt exports, is a common way of taxing only good consumed in a country. Most countries perform such border adjustment on value-added taxes (VATs). Within the United States, border-adjusts sales taxes, which apply to all goods consumed in a state, irrespective of where they are produced. Economic models imply that border adjustment does not affect trade patterns or the trade balance because the real exchange rate (REER) adjusts. The main questions is: Does border adjustment generate an offsetting movement in real exchange rate or does it work like a tax and export subsidy and raise the trade balance? Consider a country implementing a VAT or final sales tax on goods sold domestically. Imports face the tax, but exports do not. The process of adjustment depends on the extent to which the tax leads to higher consumer prices. We consider two extreme cases, one in which consumer prices rise by the full amount of the tax, and the other in which consumer do not rise at all. When consumer prices rise by the full amount of the tax, the nominal exchange rate does not need to adjust. The price of exports, which are not taxed, does not rise, and they continue to be sold in foreign markets at the same local price as before. The price of imports, which are taxed, rises by the same amount as domestically produced goods. If the tax revenue is transferred back to consumers, perhaps through a reduction in other taxes, consumer maintain their total consumption spending. Moreover, consumers do not have to switch between imports and domestic products because their prices have risen equally. The trade balance is thus not affected. The REER, which is the exchange rate-adjusted ratio of consumer prices at home to consumer prices abroad, rises by the full amount of the tax. When consumer prices do not change-because of monetary policy aimed at maintaining stable prices and or reductions in other business taxes that lower the local cost of production-the nominal exchange rate must appreciate. If it did not, firms would have a strong incentive to increase exports because they would be able to sell them abroad at the same price as at home and avoid paying the tax. Imports, on the other hand, would face the tax but would not cost any less than before. The increased supply of exports and reduced demand for imports would create an imbalance in the foreign exchange market, which would push up the value of the domestic currency. An appreciation exactly equal to the tax rate rebalances the foreign exchange market and keeps exports and imports, and thus trade balance unchanged. A country’s trade balance is equal to the gap between domestic saving and domestic investment. If the government returns consumption tax revenues to households, its savings does not rise, and household have the same after-tax real income as before. Consumption taxes do not affect the after-tax return on saving or the cost of capital, so there is no reason to expect any change to private saving or investment. Thus, with full RER offset and a constant fiscal balance, border-adjusted consumption taxes should not affect saving, investment and or trade balance (Feldstein and Krugman, 1990). A uniform VAT rate on consumption is important because it prevents distortions. If the tax is levied more heavily on some products, then there will be an incentive to shift away from those goods. In practice, most countries exclude some services, such as education, government and health as we well as basic foodstuffs. Doing so is problematic because it encourages a shift toward these generally nontraded goods. Another distortion arises because tourists should pay the tax rate of their home country but in practice pay the tax rate of the country they are visiting. When these tax rates differ, demand shifts toward the country with the lower tax rate. The difference between a VAT and a border adjusted cash flow tax (CFT) is that price adjustment is more complex under a CFT. To the extent that the nominal exchange rate does not appreciate quickly and fully, prices of imports and good with imported content are likely to rise substantially. It is less clear what happens to other goods. To fully adjust to the tax, both prices and wages have to rise. Given labor contracts, adjustment could take longer than with a VAT. In contrast, if adjustment comes through the nominal exchange rate appreciation it could neutralize the border-adjusted CFT more rapidly. Given the dollar’s status as the world’s premier reserve currency and a major target of pegged exchange rates, it is not clear how far or fast adjustment would proceed through this channel. A few studies examine the effect of VATs on trade flows, employment and prices. Desair and Hines (2005) use data from 168 countries for 1950-2000 and find that countries with a VAT export 10 percent less and have lower overall openness than countries without VAT. They also find that subsidiaries of US multinationals in VAT countries tend to export less. They argue that exports are lower because VATs tend to be higher on traded goods than nontraded goods which pushes production and consumption into nontradables. Incomplete VAT rebates to exporters compound the shift of resources toward nontradables. Nicholson (2010) uses panel data from 12 years, 29 industries, and 146 countries to examine the effect of VAT and US corporate income tax on US competitiveness. Like Desai and Hines, he finds that VATs tend to reduce trade, both imports and exports, and that the effects differ across sectors. He also finds that VATs in developing countries tend to affect US exports but not imports and interprets this finding as evidence that VAT may be disproportionately applied to good entering a country, acting as a barrier to trade. He also explores the relationship between US corporate income tax and foreign VATs in a cross-section gravity model. The results show reduced US exports and expanded US imports in country-industries where corporate taxes are highest, and VATs are present, offering some evidence that border adjustments in other countries coupled with existing US corporate income tax hurt US competitiveness. The study most closely related to the proposed border adjustment on a cash flow tax is Mooij and Keen (2012), who examine the economic effects of shifting taxation away from labor and toward consumption. The show that such fiscal devaluations have short-term positive effects on employment and trade balances, especially in eurozone countries. Because each euro member’s currency is determined by the group, no single member can appreciate to offset these events. Effects on noneuro countries are slightly smaller and not as statistically significant, although positive short-run effects remain. where vector α represents the speed of adjustment to disequilibrium and β is a vector that represents up to (n-1) co-integrating relationships among the nonstationary variables. 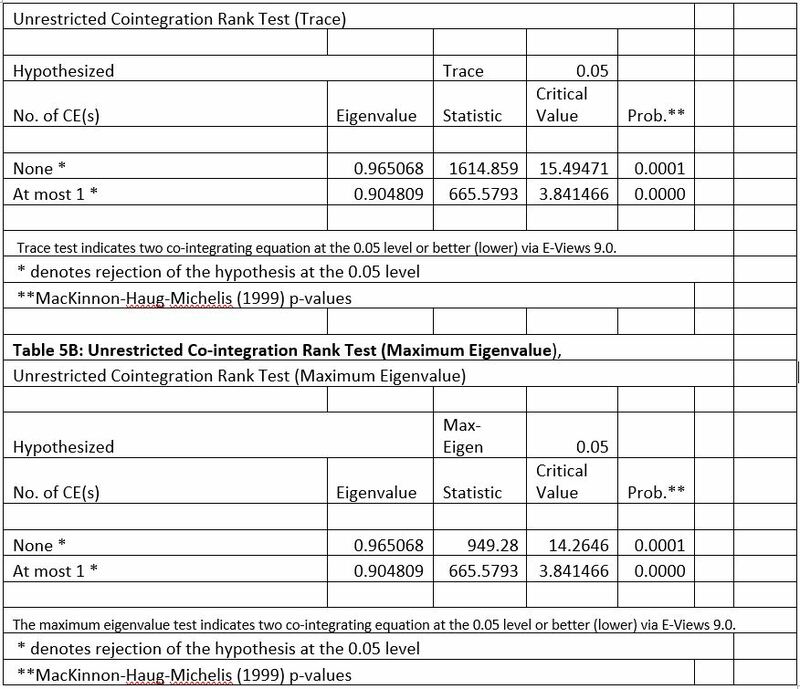 Trace and maximum eigenvalue statistics are used to test for co-integration. After Equation 1 is estimated, we test for weak exogeneity for the linear restrictions on β The terms of vector α (factor loading matrix) measure the speed at which the variables adjust towards the long-run equilibrium after a shock. The α vector of the weakly exogenous variable equals zero. To find the direction of the Granger causality between the border tax and consumption, restrictions are tested on the α vector. Selecting the optimal lag is performed before estimating the VECM from the results of a standard or unrestricted VAR model. 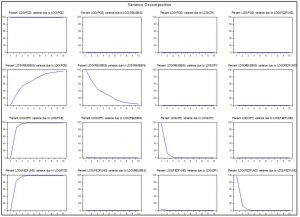 The stationary properties of the time series for each of the variables are then analyzed. After determining the presence of unit roots via the augmented Dickey-Fuller test, we investigate the existence of co-integration. More specifically, Engle and Granger (1987) indicate that a linear combination of two or more nonstationary series may be stationary. Consequently, if such a stationary linear combination exists, then the nonstationary time series may be co-integrated. Such a stationary linear combination is called a co-integrating equation and can be interpreted as a long-run equilibrium relationship among the variables. Johansen and Juselius’s (1988, 1990) maximum likelihood method was applied to investigate whether there is more than one co-integration relationship via the trace and maximum eigenvalue statistics. Johansen and Juselius’s method estimates Π using an unrestricted VAR model to test whether we can reject the restrictions implied by the reduced rank of Π and estimate the characteristic roots of Π. Once the characteristic roots are calculated, we then proceed to the λmax and λtrace , which are two tests used to determine the number of co-integrating vectors. That is, the rank of Π equals the count of its nonzero characteristic roots, i.e., the number of co-integrating vectors. The λtrace test tests for the null hypothesis that the distinct number of co-integrating vectors is less than or equal to r versus the alternative hypothesis that the distinct number of co-integrating vectors is greater than r. The λmax test tests the null hypothesis that the distinct number of co-integrating vectors is r versus the alternative hypothesis that the distinct number of co-integrating vectors is greater than r+1. Johansen and Juselius’s co-integration procedure is based upon estimating the vector error correction model as specified in Equation 2. 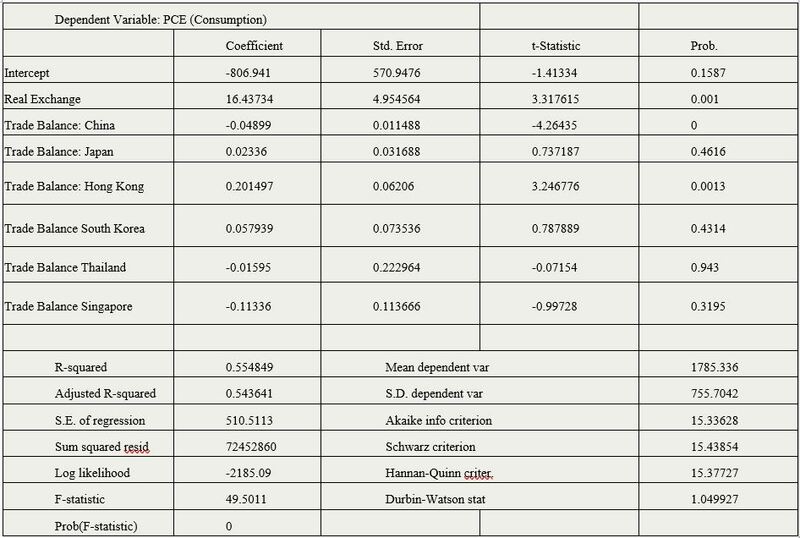 Table 1 summarizes the data sources used in this paper. The data uses monthly data from January 1994 to October 2017. Once the PCE data was obtained, the data was adjusted by 20% to reflect the border tax imposed by the Trump Administration. That is, we used the PCE as a fraction of the proposed tax. The first step of the analysis is the estimation of an OLS model showing the relationship between the PCE, the trade balances of several countries, and the real exchange rates (RBIUS). 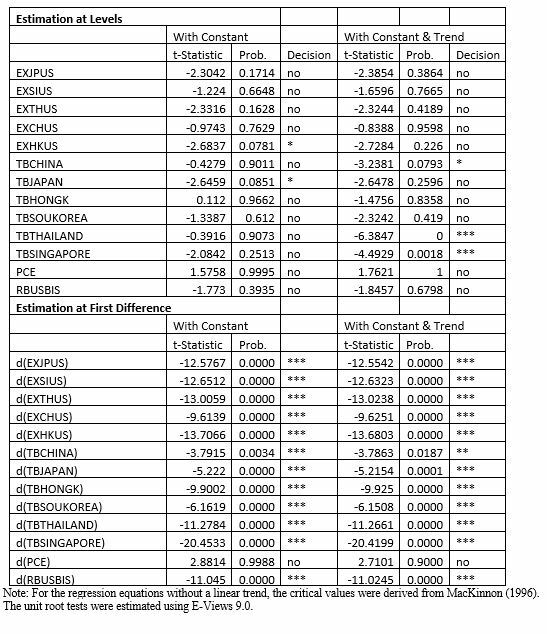 Table 2 summarizes the results from the OLS regression. The purpose of this OLS regression is to check to see if a cointegration exists. The cointegrating regression Durbin Watson (CRDW) is 1.049 which indicates that the residuals are not stationary. Then the Dickey Fuller test was estimated, and it was -2.99 which is greater than -3.39. From this, it appears there no long run relationship exists. Consequently, we will need another way to estimate the long-run relationships. The next step is the development of the unrestricted vector autoregressive model (VAR) to determine the optimal lag length for estimating the subsequent models. The results are presented in Table 3. According to Schwarz’s Information Criterion (SC) and the Hannan-Quinn Information Criterion (HQ), the best lag length is one. The Augmented Dickey-Fuller (ADF) test was used to determine the order of integration by testing the unit root hypothesis in the level of variables and in their first differences. The null hypothesis is the presence of a unit root. The ADF is used in the stationarity analysis. Lag lengths are decided by evaluating Akaike’s Information Criterion (AIC) and Schwarz’s Information Criterion (SIC). 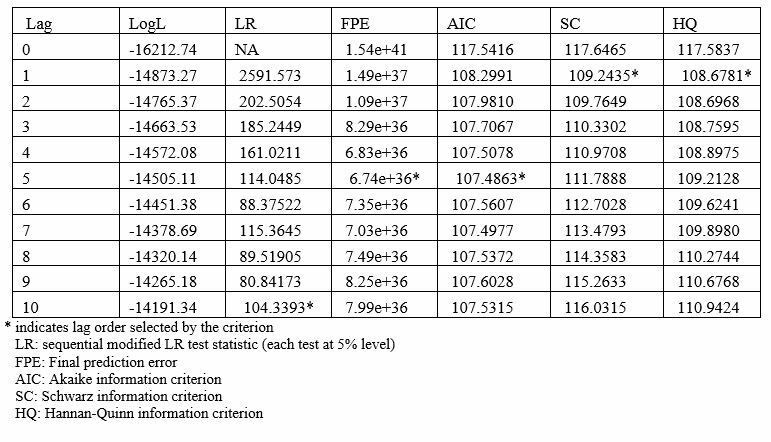 Table 4 summarizes the results from the ADF tests. The number of co-integrating vectors (CVs) is determined from the trace and maximum eigenvalue tests with an initial (null) hypothesis that there is a lack of a co-integrated vector in the system. 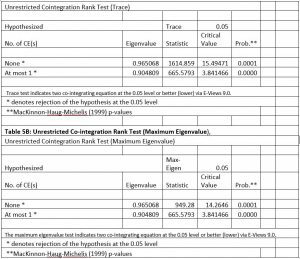 As seen in Table 5A the trace statistic (665.58) is greater than the critical value of 3.841 at the 5 percent level, thus rejecting the null hypothesis of a lack of long-run co-integration between the variables. This result is confirmed by testing a second null hypothesis that there is at most two co-integrated vectors. Table 5B confirms the results from Table 5A via the maximum eigenvalue test. The standard errors are given in parentheses below each coefficient in the normalized co-integration equation. The RBUSBIS is significant and has the correct sign with the relationship with PCE. For the VECM, the multivariate Lagrange Multiplier (LM) statistics showed that the residuals are not auto-correlated since the p-value is greater than the generally accepted level of significance of .05. The multivariate Jarque-Bera test confirms that the residuals for the VECM were not nearly normally distributed because the multivariate test of skewness show that the residuals are somewhat skewed while the test for kurtosis indicates a problem with kurtosis. Finally, VECM Residual Heteroscedasticity Tests were also applied to the VECM, and the tests show there is no problem with VECM residuals with regards to heteroscedasticity since the p-values are greater than 0.05. After estimating the long-run VECM model, we estimate the short-run causality model. Under co-integration, the dynamics should be phased into the vector error correction term. This allows us to assess both long- and short-run causality on the χ2 -test of the lagged first differenced terms for each right-hand-side variable and the t-test of the error correction term. If the variable x “Granger causes” variable y, then the time series of variable x necessarily contains information that leads to the prediction of variable y. In other words, Granger causality is a statistical concept that shows the predictive power of past values in the determination of the accuracy of forecasts. In fact, Granger causality may be indicative of the existence or nonexistence of short-run relationships between variables. Those independent variables that are statistically significant exhibit Granger causality, while statistically insignificant variables do not. The significance of the coefficient of the error correction term of Δ (PCE) shows that there is a long-run relationship between PCE, and their associated independent variables. In addition, the disequilibrium would be corrected after any external shocks to employment. Intuitively, the mechanics of the VECM imply that the PCE are initial receptors of exogenous changes to the long-run equilibrium. The remaining independent variables must bear the burden of the short-run adjustment exogenously in different proportions to return the system to the long-run equilibrium. The raw VAR parameter estimates are rather difficult to interpret directly. For this reason, the focus is on variance decomposition and impulse response analysis. 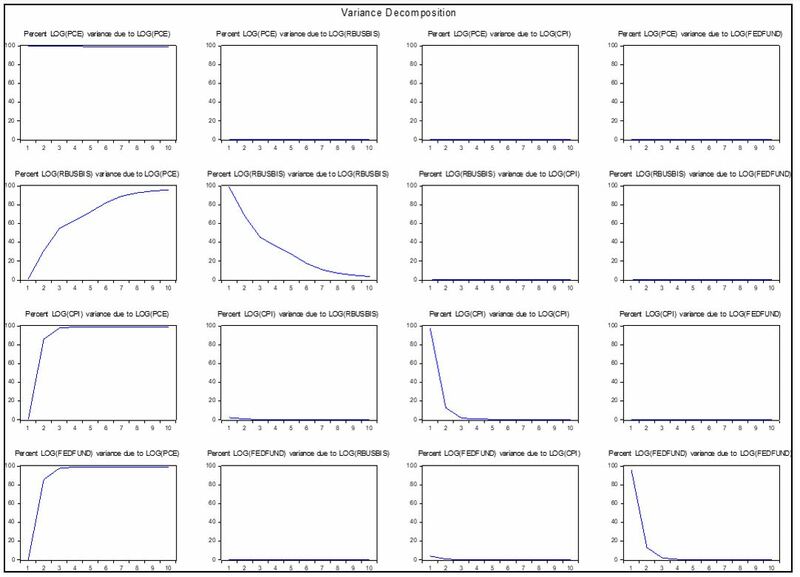 To gain a better understanding of the main channels of influence in the variables of interest, the variance decomposition is presented in Table 7. The Choleski factor is used to normalize the system so that the innovation matrix is diagonal, thereby allowing one to consider experiments in which any variable or set of variables is independently shocked. The conclusions drawn are often sensitive to normalization, or ordering chosen since changing the ordering of the equations alters the Choleski factor. Intuitively, it determines how much of the contemporaneously correlated part of the shocks to the system is attributed to each of the system variable. 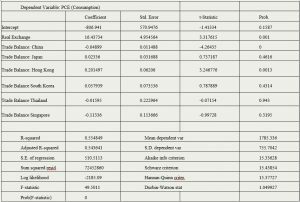 The results indicate that almost 60 percent of the total forecast error variance in the real exchange rate (RSUBIS) accounts from the shock in PCE (Personal Consumption Expenditure) over a 10 step-period. While 80 percent of the total forecast error variance in the trade balances accounts from the shock of PCE over a 10-step period. These results support our hypothesis that any changes in the consumption tax directly affects the real exchange rates and prices. With the new Administration considering a destination cash flow tax also known as border tax, this study sheds light to the economic implication of a border tax (also known as consumption tax) to exchange rates and balance of trade. Using a dynamic model, our studies shows that changes in consumption tax are highly correlated to the real exchange rate over time. However, changes in consumption tax has no long run relationship with the balance of trade. This is consistent with the theory that border taxes can only appreciate the value of the currency (exchange rate) but if tax revenue is transferred back to consumers, perhaps through reduction in other taxes, consumer maintain their total consumption spending. Moreover, consumers do not have to switch between imports and domestic products because their prices have risen equally. Thus, trade balance should not be affected. Auerbach, A. & Devereaux, M. (2017). Destination-based cash flow taxation. Oxford University Centre for Business Taxation Working Paper (January). Oxford University. Last accessed October 15, 2017 from https://eml.berkeley.edu/~auerbach/CBTWP1701.pdf. Benedek, D, R., de Mooij, M., Keen & Wingender, P. (2015). Estimating VAT Pass-Through. IMF Working Paper 15/214. Washington, International Monetary Fund. De Mooij, R. & M. Keen. (2012). Fiscal Devaluationand Fiscal Consolidation: The VAT in Troubled Times. IMF Working Paper 12/85. Washington: International Monetary Fund. Desai, M., & Hines Jr, JR. (2005). Value-added taxes and international trade: The evidence. University of Michigan. The was last accessed on November 1, 2017 from: https://www.law.umich.edu/centersandprograms/lawandeconomics/workshops/Documents/Fall2005/hines.pdf. Engel, R. F. & Granger, CWJ. (1987). 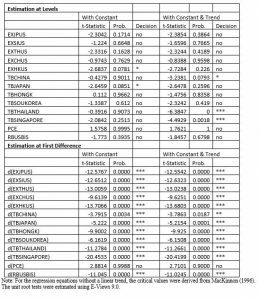 Co-integration and error correction: Representation, estimation and testing, Econometrica, 55, 251–278. Johansen, S. (1988) Statistical analysis of cointegration Vvectors, Journal of Economic Dynamics and Control, 12, 231–254. Johansen, S. & Juselius, K. (1990). Maximum likelihood estimation and inference on cointegration, with application for the demand for money, Oxford Bulletin of Economics and Statistics, 52, 169–210. MacKinnon, James G. (1996) Numerical Distribution Functions for Unit Root and Cointegration Tests, Journal of Applied Econometrics, 11, 601–618. MacKinnon, James G., Alfred Haug, and Leo Michelis. 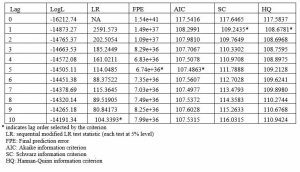 (1999) Numerical Distribution Functions of Likelihood Ratio Tests for Cointegration, Journal of Applied Econometrics, 14, 563–577. Nicholson, Michael. 2010. Value-Added Tax and US Trade Competitiveness., Washington: Office of Competition and Economic Analysis, International Trade Administration, US Department of Commerce. [i] The abundance of VECM equations are not provided to conserve on space.